An Artist Recital Series performance by the Bang on a Can All-Stars. Believing was commissioned by NPS Dutch Radio for the Bang on a Can All-Stars. Ridgeway was commissioned for the Bang on a Can All-Stars with the generous support of the all the members of the People’s Commissioning Fund, the Greenwall Foundation, and the Jerome Foundation. For Madeline by Michael Gordon was commissioned by Bang on a Can with support from Lincoln Center. Formed in 1992, the Bang on a Can All-Stars are recognized worldwide for their ultra-dynamic live performances and recordings of today’s most innovative music. Freely crossing the boundaries between classical, jazz, rock, world, and experimental music, this six-member amplified ensemble has consistently forged a distinct category-defying identity, taking music into uncharted territories. Performing each year throughout the U.S. and internationally, the All-Stars have shattered the definition of what concert music is today. Together, the All-Stars have worked in unprecedented close collaboration with some of the most important and inspiring musicians of our time, including Steve Reich, Ornette Coleman, Burmese circle drum master Kyaw Kyaw Naing, Tan Dun, DJ Spooky, and many more. 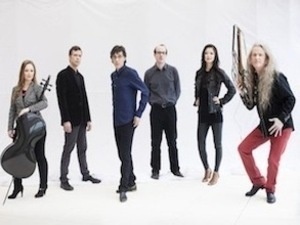 The group’s celebrated projects include their landmark recordings of Brian Eno’s ambient classic Music for Airports and Terry Riley’s In C, as well as live performances with Philip Glass, Meredith Monk, Don Byron, Iva Bittova, Thurston Moore, Owen Pallett, and others. The All-Stars were awarded Musical America’s Ensemble of the Year in 2005 and have been heralded as “the country’s most important vehicle for contemporary music” by the San Francisco Chronicle. Recent project highlights include Field Recordings, a major new multi media project featuring hot-off-the-press commissioned works by Tyondai Braxton, Mira Calix, Anna Clyne, Dan Deacon, Bryce Dessner, Florent Ghys, Michael Gordon, Jóhann Jóhannsson, David Lang, Christian Marclay, Paula Matthusen, Steve Reich, Todd Reynolds, Julia Wolfe, and Nick Zammuto; the world premiere, performances, and recording of Steve Reich’s 2x5 including a sold-out performance at Carnegie Hall; the group’s multiple visits to China for the Beijing Music Festival and Hong Kong Arts Festival; the US tour and Carnegie Hall performance of Julia Wolfe’s Steel Hammer, an evening-length staged concert with Trio Mediaeval; commissioned works by Louis Andriessen, Bill Frisell, Ryuichi Sakamoto, and more. With a massive repertoire of works written specifically for the group's distinctive instrumentation and style of performance, the All-Stars have become a genre in their own right. The All-Stars record on Cantaloupe Music and have released past recordings on Sony, Universal, and Nonesuch.